The Hosgri Fault Zone trends subparallel to the south-central California coast for 110 km from north of Point Estero to south of Purisima Point and forms the eastern margin of the present offshore Santa Maria Basin. Knowledge of the attributes of the Hosgri Fault Zone is important for petroleum development, seismic engineering, and environmental planning in the region. 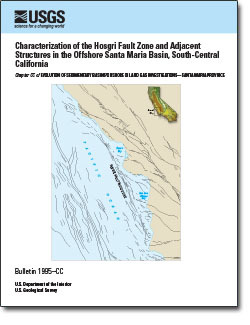 Because it lies offshore along its entire reach, our characterizations of the Hosgri Fault Zone and adjacent structures are primarily based on the analysis of over 10,000 km of common-depth-point marine seismic reflection data collected from a 5,000-km2 area of the central and eastern parts of the offshore Santa Maria Basin. We describe and illustrate the along-strike and downdip geometry of the Hosgri Fault Zone over its entire length and provide examples of interpreted seismic reflection records and a map of the structural trends of the fault zone and adjacent structures in the eastern offshore Santa Maria Basin. The seismic data are integrated with offshore well and seafloor geologic data to describe the age and seismic appearance of offshore geologic units and marker horizons. We develop a basin-wide seismic velocity model for depth conversions and map three major unconformities along the eastern offshore Santa Maria Basin. Accompanying plates include maps that are also presented as figures in the report. Appendix A provides microfossil data from selected wells and appendix B includes uninterpreted copies of the annotated seismic record sections illustrated in the chapter. Features of the Hosgri Fault Zone documented in this investigation are suggestive of both lateral and reverse slip. Characteristics indicative of lateral slip include (1) the linear to curvilinear character of the mapped trace of the fault zone, (2) changes in structural trend along and across the fault zone that diminish in magnitude toward the ends of the fault zone, (3) localized compressional and extensional structures characteristic of constraining and releasing bends and stepovers, (4) changes in the sense and magnitude of vertical separation along strike within the fault zone, and (5) changes in downdip geometry between the major traces and segments of the fault zone. Characteristics indicative of reverse slip include (1) reverse fault geometries that occur across major strands of the fault zone and (2) fault-bend folds and localized thrust faults that occur along the northern and southern reaches of the fault. Analyses of high-resolution, subbottom profiler and side-scan sonar records indicate localized Holocene activity along most of the extent of the fault zone. Collectively, these features are the basis of our characterization of the Hosgri Fault Zone as an active, 110-km-long, convergent right-oblique slip (transpressional) fault with identified northern and southern terminations. This interpretation is consistent with recently published analyses of onshore geologic data, regional tectonic kinematic models, and instrumental seismicity. Willingham, C.R., Rietman, J.D., Heck, R.G., and Lettis, W.R., 2013, Characterization of the Hosgri Fault Zone and adjacent structures in the offshore Santa Maria Basin, south-central California, chap. CC of Evolution of sedimentary basins/onshore oil and gas investigations—Santa Maria province: U.S. Geological Survey Bulletin 1995-CC, 105 p.